ne recent evening, just before sundown, a battleship-gray vessel steamed past the Oriental anchorage, motored under the bridge and dropped anchor at the mouth of Greens Creek. 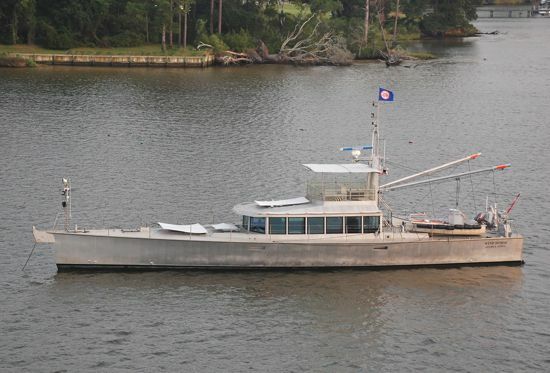 The vessel’s plumb destroyer bow and ash colored hull seemed out of place in North Carolina’s sailing capital. The vessel looked too purposeful to be merely a pleasure boat – too angular, too metallic. It had onlookers wondering. Was this a navy vessel, perhaps from a far off country? No. It was Steve and Linda Dashew aboard their 83-foot vessel “Wind Horse”. Wind Horse anchored in Greens Creek. To the casual observer, Wind Horse looks military. “We are often mistaken for the Navy,” Linda says. To understand Wind Horse and her unconventional looks, one has to look back into Steve and Linda’s sailing past – about half a century’s worth. 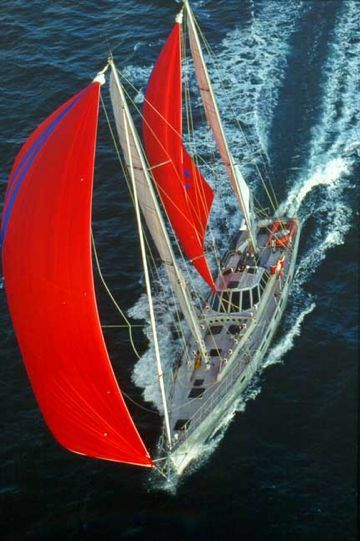 In the 1960s, Steve set the world speed sailing record aboard his D-Class catamaran “Beowulf”. Later, the couple sailed around the world in the “Intermezzo II”, their Columbia 50. Over the years, though, they never quite found the boat that met their cruising needs. So they designed and built the Deerfoot and Sundeer line of sailboats. Long and narrow, the premise behind these 60 and 70 foot boats was that a couple could sail them offshore in comfort and safety without additional crew. Not only did they design and build these boats, they sailed them. Lots. Over the years, the couple racked up tens of thousands of offshore miles. Fast passage makers, these vessels are known to sail up to 300 miles per day while most sailors settled for half that. Steve says this allowed the boats and their crews to minimize time, and therefore poor weather, offshore. 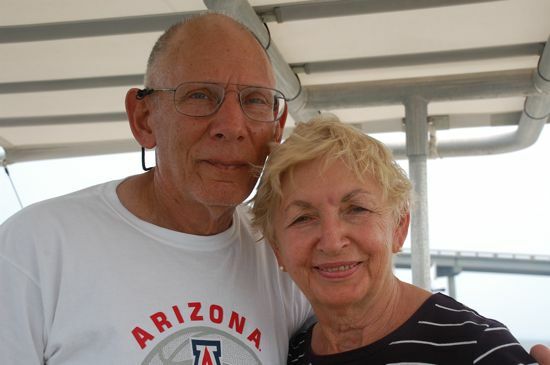 Steve and Linda chronicled these experiences in books such as “Surviving the Storm”, “Offshore Cruising Encyclopedia” and “Mariner’s Weather Handbook”. In time, though, Steve discovered a change that might not be as easily skirted or outrun. It wasn’t a meteorological storm. It was, Steve says, the march of time. Hauling and lowering sails on passage, day and night, in weather good and poor, was not as easy as it once was. So he and Linda decided on a life course correction. Not content to stow the anchor, they did what many diehard sailors would consider treason. They took up powerboating.